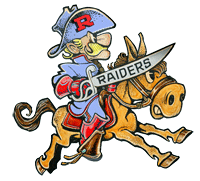 While neither team was at their full strength, Live Oak due to illness and Rummel due to football players who are just starting their season, the Raiders nonetheless showed they will be a strong force with which to contend in Division II. Rummel won six of the seven matches contested last Wednesday evening at the Rummel gymnasium. Falls were scored by Raiders Chris Montalbano, Brandon Willis, Robert Fairchild Dawson Mire and Josh Ramirez. Live Oak's sole win was an 8-3 decision by Brennan Webb over Dylan Hezeau. In a match in which both wrestlers spent a lot of time on their backs, Rummel's Dawson Mire pulled off what many consider a big upset when he pinned previously undefeated Ethan Alphonso at the three-minute mark of their 138 lbs. match. Most of the better known wrestlers at 138 lbs. (although several have also dabbled at 132 lbs.) have already tasted defeated at the hands of at least one of the others, including, Billy Harrison of St. Paul's, David Polito of Catholic, Eli Larriviere of Jesuit, David Clement of Holy Cross, Joshua Bell of Ehret, Glen Gebo of De la Salle, Austin Franklin of Brusly, Seth Gambill of Brother Martin, Mire of Rummel and now Alphonso of the Eagles. This leaves Destrehan's Nicholas Lirette as the front-runner at the moment, as he is 12-0 and has quality wins over Franklin, Gebo and Mason Fereday of Dutchtown. Sulphur's Dustin Doucet is 5-0, and he has a win over Comeaux's Pierce Richard, who gave Gambill his only loss on the season. Nothing is crystal clear in this weight class yet, aside that it is one of the strongest in the state. Those who drop to 132 lbs. will not find it any easier as that includes the likes of Ehret's Joseph Davis-Lucas, Landon Wheat of East Ascension, Josh Partin of Airline and Cole Clement of Holy Cross. Raiders and Eagles wrestlers may meet each other at the Louisiana Classic, but with luck a match between both squads at their strongest may present itself at the Live Oak Duals on January 23rd. You may not make electronic copies of these copyrighted materials nor redistribute them to 3rd parties in any form without written permission.